Because I was travelling for the major part of the last two months, I decided to combine my empties. Also, I had to photograph products in batches, because there was no way of saving them or bringing them back home and wasting precious luggage space. I have divided this month's empties into three parts, depending on what products finished at the same time. Some of these products were purchased from Europe and the UK while I had packed the others. Check out what I had packed here. During my trip, I discovered some amazing European brands, and the best conditioner ever - and sadly may never see it again. You will find the sorry tale further below. 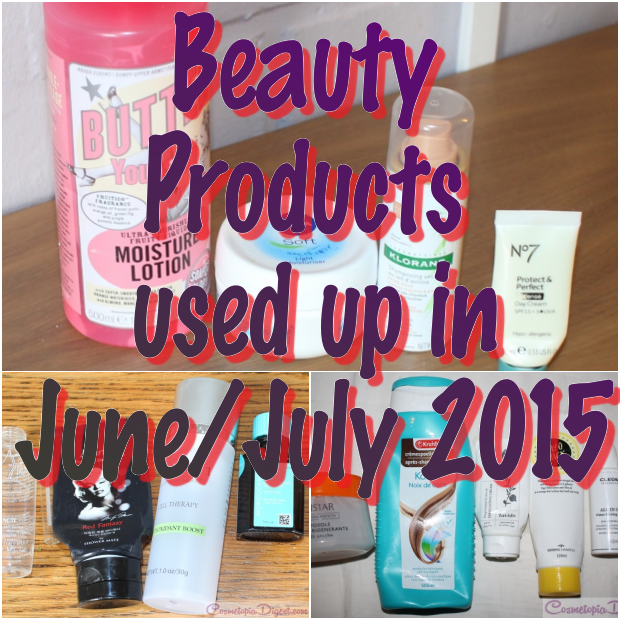 Check out the beauty products I used up in June and July 2015 and my quick thoughts on each. The weather was cold and dry enough for my skin to soak this up. I love S&G skincare and this paraben-free, awesome-smelling lotion was no exception. Repurchase? Already did. I have a nice stockpile of Soap & Glory. I took this mini jar along and finished it in three days flat because I moisturise all over two times a day. Light and fluffy, it absorbed nicely enough and kept the reptilian fish scales away. Repurchase? Once in a while. There are plenty of body butters to try. From an Ipsy bag. The travel size made this convenient, especially on those bad hair days. It did a decent job, but was not as brilliant as Batiste or even Oscar Blandi - both those have more brunette versions while this needed brushing. Repurchase? I don't think Batiste likes me cheating on 'him'. The Daily Fail raves about this range all the time. I like the No7 Protect and Perfect Serum, but surprisingly, the day cream does not work for me. This made my skin oilier than ever - I am sure MPs who saw me (I visited the House of Commons) must have contemplated oil rigs. Repurchase? Only if they offer me billions after the world oil supply runs out. I had taken this Korean cream along for use as a night cream, on the face. But I ended up using it as a foot cream. Why? For starters, it was too thick - and not matte - on my face. Secondly, I believe it added to my breakout woes. And anyway, I had forgotten to pack foot cream and I thought this was thick enough. Did it do my feet any favours? Yep, I got a fungal infection (Derm's diagnosis. Symptom: peeling off in round patterns) and had to bury my feet in fluconazole. Repurchase? I would rather face the lions in the Colosseum. Or be buried forever in the Catacombs. I think I put that quite subtly, right? Pretty much unknown outside of Italy, Collistar is a mid-end brand sold in Sephora Rome and in Duty Free, and was the find of the trip for me. I am in LOVE with their lippies and eyeshadows. More about them later. This is a brilliant, paraben-free post-sunburn cream. I was roasted from the Colosseum/Forum/Palantine and the SA in Sephora saw me that evening and suggested this after each shower. It is remarkably cooling and soothing and made my tender skin feel much better. Repurchase? I came home with four of these, despite the luggage weight. And I am beating myself up for not buying the after-sun shampoo as well. BEST. CONDITIONER. EVER. Also best CO-wash ever. I am a fool! I bought this in a drugstore in Brussels after I found the hotel did not have toiletries. Unfortunately, I washed my hair only after leaving Brussels and let me tell you, my hair smelled so amazing that complete strangers in the Catacombs complimented me. And now, I've run out :( And I have no idea where I can buy this. Repurchase? I will SEND a lipstick to anyone who points me to a website which will ship this worldwide. I have only found websites that ship within the EU. This is an Israeli brand. The colour of mud, this smelled rancid (aromatic, my @r$3), looked pukish and felt abrasive. Repurchase? For gifting my worst enemies if I run out of itching powder. I love using mayonnaise on my hair as a deep condish, so I presumed this Korean hair pack would make my hair equally soft and smooth. Sadly, it was grease in a tube and left my usually dry hair oil-slicky until the next wash.
Repurchase? When I want to dress up as Severus 'Greasy Git' Snape. I had actually bought this from Memebox instead of getting it in a box. In fairness, I had points to use up - that was when they shipped worldwide. The thing is, I packed it expecting it to be a hydrating, refreshing facial spray. Imagine my surprise when, halfway through a three-hour queue to attend the Papal Mass, I discovered it was actually a white cream. I used the rest of it up as a body moisturiser. Ugh! Who calls a cream a "water... finisher"??? Repurchase? No, I have enough creams to go around the Equator a couple of times. I thought it was a facial spritz. I loved this eye cream. It made my under-eye areas hydrated in the cold and in the heat. It was yellowish and absorbed quickly, so I could apply primer and makeup above it without problems. Repurchase? For starters, they do not ship where I live. For another, I have just invested in a bunch of Philosophy and First Aid Beauty eye creams. Two-phase makeup removers are a great idea for travelling because they do the job quicker, whereas you need more time and effort with micellar water. Bi-Facil is fail-proof for me and it does not irritate my eyes or skin. Or leave greasy residue. Repurchase? Already did, from Boots. I may not use this everyday, but when I am on full night-face mode and short of time in the evenings, one cotton pad saturated with Bifacil does the trick. I took along my favourite perfume ever for this trip. Somehow, I have always preferred Coco Mademoiselle to the more famous No. 5. Repurchase? I already have the full-sized bottle and will repurchase when I run out. Soap bars are better while travelling, but I wanted to finish up this deluxe-sized Korean sample. It smelled nice and lathered well enough. Nowhere near my beloved Molton Brown, though. Repurchase? Nope; a gazillion better shower gels out there. Plus, I bought about 20 soaps from Rome. This has been my go-to serum for a couple of months now. It reminds me of Lancome Advanced Genefique, but the latter is easily available for me (and you get amazing GWPs). Repurchase? Nope. They don't ship where I live. Besides, I am returning to Advanced Genefique. It may contain cones, but it eats up the frizz and dries my thick hair quickly even in humid weather. I love the texture of this oil. Used anything up lately? Loved/hated it? Tell me in the Disqus comments widget below! Mostly purchased by me. Some PR samples.